Time's Up. Thanks for entering. Phew! I've made it through my first 100 posts. It's taken a hearty dose of perseverance with a healthy dollop of obsession and a pinch of sleeplessness to pull it off. Thank you, dear readers, for coming every day, for leaving comments, and for being my friends. I feel a peculiar sense of kinship with so many of you, considering we really haven't "met." I read the first posts I wrote, and I cringe at the robotic stiffness and formal style. 100 posts later, I barely hit spell check any more, since I feel like I'm sharing anecdotes and recipes with a next door neighbor over a chocolate chip cookie. And our numbers are growing, up from less than 100 readers a week to about 4500. I'm excited to have my first give away, and I hope you'll tell your friends and family to come and enter as well. You're also welcome to post a link from your blog, if so inclined. With four winners, the odds are looking pretty good. Contest ends July 30, 2008 at 11:59 PM Eastern Standard Time. Winners will be randomly chosen. One entry per person and don't forget to post a name if you post as "anonymous." Answer the following question in the comment section to be eligible: What was the first recipe you remember making alone? 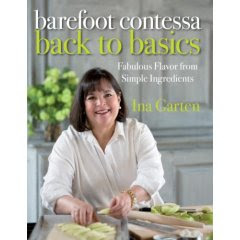 #1: Ina Garten's newest "Back to Basics" cookbook. It's so new it's not even available yet-but I'll place the order at Amazon and have it delivered right to you. This one is going to be good-maybe her best yet-since the focus is simple ingredients and basic techniques. #3 A red Nordicware coffee cake tube pan. I have one in periwinkle blue; it's perfect for an elegant yet homey Sunday morning cake. It makes such a pretty display, you almost don't even want to cut in. #4 An apple green classic bundt cake pan, plus a tunnel of bundt insert. Bundt cakes are beautiful on their own, but with this extra insert, you can include a surprise inside out frosting, filling or ice cream. I'll post my top 1o out of my past 100 favorite recipes on Wednesday. Decisions, decisions! I'm choosing based on reader feedback, so let me know if you have a stand-out favorite. My mother's whoopie pies. And oh man, I've probably made them more than anything else. Ohh, Ohhh, Ohhhhhh pick me, pick me!!! I want that new Ina Garten book so badly, oh and the pan too. In the meantime I am so happy to congratulate you on your 100th post! Well done you. It is not hard to see why your readership is growing in leaps and bounds. Every visit is like a visit with a much loved and trusted friend. In short, it feels like home! My first thing I made alone was when I was about 6 or 7 and was my own "recipe" for ice cream "pie." It basically entailed me melting down some ice-cream,(usually chocolate) spreading it around in a aluminum pie plate, putting various colored sprinkles on top and re-freezing it, then cutting into slices with a butter knife. I was pretty proud and thought it tasted great although for some reason no one else in my family would eat it! I'd share my salmon patties that turned into salmon hash story from when I was 12 but I am still trying to get over the trauma! That's easy...my attempt at pancakes when I was like, 6 or 7. The ended up more like stucko but that's earliest memory. It must have been scrambled eggs. But I do remember getting to make a box cake mix very young. Being the oldest of 5, I think I got in the kitchen and wanted to be there, pretty young! Congratulations on your 100post! I look forward to the next hundred! I start my day off here and your song makes me sing the rest of the day. Good luck little lady! Pizza! Oh the great feeling of making the family happy when that piping hot plate of goodness was set on the table! Been making it weekly ever since! The first dish I made all by myslef was scrambled eggs...I think I was 10. Hi, I think the first recipe I remeber makin alone was your basic spaghetti. Mom had us in the kitch really early so I'm not exactly sure what it was. The first recipe I remember making was snickerdoodles. They are one of the easiest cookies to make, yet very tasty. You know - I remember the first thing I made. It wasn't with a recipe though - lol. I though these fresh turkey wings were chicken. I was 11 years old. I seasoned them, floured them, and fried them up like they were chicken wings. Um, note to self - never fry turkey wings. The first thing I made by myself was scrambled eggs. My mom even bought me my own little pan to cook them in. I was so proud! Snickerdoodle cookies. I also remember, later, making lemon squares for the first time and not realizing that, unlike snickerdoodles, you weren't supposed to dump all the ingredients in the bowl together. I hadn't even THOUGHT of reading the directions. Wow! 100 posts already. Congrats! It is funny that I can't remember exactly what I first cooked. I remeber making English muffin pizzas a lot as a kid so I will go with that. love your site, congrats on your 100th post!! The first thing I remember making...gosh, I think it was Pumpkin Rolls with my Nana...she has been gone for a long time now, but I still have a vivid memory of that day rolling those rolls in powdered sugar covered dish cloths. That would have to be Mars Bar Cake slices - they are sooo good - I still make them today for my lot. Congrats on your 100th post!! The first thing I remember making alone was some sort of vegetable casserole concoction, I sort of shudder at the thought now. I can't believe you've hit 100 posts already as I've only recently discovered your blog. Definitely peanut butter fudge... I used to make it all the time as a kid, but it's funny... I can never get it turn out right now that I'm older. I would have to say- that I LOVED your recipe from cran-blueberry scones, I even posted a link to it on my blog after making them- very yummy!!! Another fav is the peach bbq chkn- so easy and sooo yummy!!! Congrats on 100 posts!! The first thing I ever made alone was probably cookies...I was pretty good at making cookies when I was little. The first thing I can remember making on a regular basis in the kitchen was a pigs-in-a-blanket type recipe from a kid's cookbook. It was quite yummy with a hotdog and american cheese toothpicked into a piece of white sandwich bread. It doesn't get more kid friendly than that. Dipped in ketchup it was my favorite meals for most of my sixth and seventh years. When I was a teenager, I decided to make some fortune cookies. Found a recipe and plunged in. Didn't realize the recipe made literally HUNDREDS of cookies! Got about a third of the way through and was really tired of making cookies so just dumped the rest of the dough out! a cake for easter when I was 8, but I remember mixing all kinds of digusting concoctions before that by just kind of pouring everything I could find in a bowl and mixing it. Yuck! Anyway, congrats on your 100th post! Congrats on your 100th post. Time to celebrate with my 'Yummy' recipes on my blog. Congrats on the posts and your readership!! I'm so embarrassed at some of my very early posts as well. I wasn't sure what I was doing and oh, the photography! My first culinary creation was brownies from a mix. My first from scratch recipe would be good ol' chocolate chip cookies! Obviously, I've loved sweets from a young age. The first thing I made alone was in college - I attempted my mom's famous homemade spaghetti sauce. It was delish! I love your blog! Congrats on 100 posts! I love checking in every morning to see what you are making. The first thing I made on my own was some cheese sauce in the microwave at a sleepover with a friend. We were quite proud of our accomplishment! I think the first recipe I ever made was Chocolate Chip Cookies. Yum. Your blog is my favorite way to wake up in the morning. I go straight to the computer to see what Prudy's making today. It's no surprise your readers feel like they are all your friends. You always make friends wherever you go. From people in a dressing room, to passengers on planes, and people simply walking down the street. People always want to stop to talk to you, and your readers are no different. Your'e doing a great job with your blog, and I can't wait to see what else is in store for you. 1st thing I remember making --chocolate chip cookies of course. Made them often, great entertainment I guess. I cooked my mom's recipe for spaghetti and meat sauce. hmmmm, lets see that was a long time ago but i think it was probably the old standby chocolate chip cookies. gotta love em. congrats on 100!!!! woo. The first recipe I made alone was chocolate chip cookies! I'm sure I was fulfilling a sugar craving and probably ended up eating more dough than actual cookies (and still do...haha!). The recipe I am most "proud" of for making on my own are my mom's egg noodles, which are served at every major holiday! I think the very first thing I ever made alone was my Grandma Kennedy's Coconut Pound Cake. To this day, it is still my very favorite cake recipe. It will forever make me think of her. And congrats on your 100th post! Wishing you another 1000 of greatness! Fun giveaway and congrats on your 100th post! The first thing I think I remember making on my own was chocolate chip cookies. Kind of boring but it was a BIG deal to me then! Congratulations on your 100th post!! And I just have to tell you that my kids love the music on your blog, especially "if I knew you were coming I'd have baked a cake", they are always like, "turn it up, Mummy!" ohh, I just love that green apple bundt pan! It's just Gorgeous! i know the answer to this one. Simply the most delicious apple crumble ever. hmph, at least it was to me then when i was in high school. Didn't help that we were graded for it during home economics class. hehe. Anyway, congrats on making it thru 100 posts! You've got a rather big fan base over here.. hehe. First thing I made by myself was my mom's chocolate chip cookies. They have a special ingredient that everyone says make them perfectly soft. Congrats on your 100 posts! I love your site, keep up the good work! Chocolate Chip Cookies - probably around age 8. But, I think my older sister probably was helping. What a gal! Congratulations on all your hard work! We're all so proud of you and your amazing accomplishments. I'll be bragging about my cool older sister forever. My first cooking experience: One summer I was driving mom crazy, so she taught me how to make homemade bread....I must have been very very bored. :) I still love bread. Congratulations! That is quite an accomplishment. I found your blogs a few months ago and have been visiting regularly ever since. I think chocolate pudding out of a box! Or maybe scrambled eggs? Congrats on your 100th. Everyone I have sent over here loves your blog. I'm so glad Michal posted about you! Scrambled eggs. I remember being so proud that my mom would let me use the stove. I was probably around eight. I started cooking pretty young with 4-H. The one I can remember though was snickerdoodles. I put in 1 tablespoon instead of 1 teaspoon. I can't eat snickerdoodles to this day. I think it was baked apple pancake...I know I helped my mom cook often, but I think that was the first thing I made on my own. Congrats on the 100th post! Peanut butter and jam bars. I was in kindergaden and wanted to make some afternoon snacks. We had a school fundraiser and everyone was supposed to submit a favorite recipe for a recipe book. I picked snickerdoodles, even though I never had made them. I did make my first batch soon after that. Love your site!! The recipes are WONDERFUl!! First recipe I remember making on my own would have been salt water taffy. My mother's spaghetti and meat sauce. Kudos on your 100th post. Oh Prudy, you are so sweet! I'm so thankful that you allow me into your kitchen everyday. I consider you a friend as well. 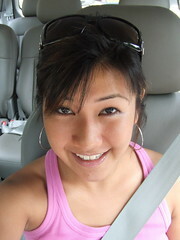 In fact, you were my first "bloggie" as The Husband likes to say (Blog Buddy). The first thing I ever made (don't be surprised here) were enchiladas. It's an old family recipe so I made them as a family for many years... then started making them on my own. As for readers favorites: that's tough. I have been making guacamole at least twice a week for the past 4 weeks because of you. The salsa verde burgers were a HUGE hit and beyond delish! Good luck sorting it all out. I remember making my own grilled cheese on a skillet thinking, I was so cool. Probably pre-teen. Congrats on your 100th post! congrats on your 100th. keep em coming! The first recipe I can remember making on my own was a birthday cake for my mother. It looked fabulous, but in true sitcom fashion I had used salt instead of sugar. Needless to say, we went out for ice cream that night. This is why I desperately need the new Ina Garten cookbook! The first thing I ever made was egg salad, I think I was 11 years old, my mom taught my 4H group, and egg salad was one of the first recipes we tried. Good memories! Lemon bars! They are still my favorite! I think it chocolate chip peanut butter bars! You have a lot on your plate and a very cute family! Congrats on your blog. I made good old chocolate chip cookies with the recipe straight off the nestle toll house bag. Congrats on the 100th post!! I really enjoy it, and hope you keep it up for a thousand more!! I think the first things I ever made alone were various fruit smoothies for myself, and I still do! I love Give Aways!!! I never win, but it's worth a try!!! I love the question...it really got me thinking. I remember a kid's cookbook that my mom got for us kids. In it was a recipe for Orange Julius. I remember making them all the time as a kid. It was easy, and I could do it all by myself! Fun prizes! I hope I win! Thanks Prudy! Congrats on your 100th post! I think the first thing I made was macaroni and cheese. Not very creative, I know, but a staple in childhood! Congrats on your 100th post! Since I've started food blogging, the amount of sleep I get has decreased, and I've gained weight. But who cares! It's fun. Snickerdoodles with my good friend in 6th grade. I think fondly about that day often...she passed away a year later. Scrambled eggs! It's a cute story, actually. All the kids in my family were taught scrambled eggs as their first cooking experience. I was SO excited when my mom said I could make them the next morning that I actually sleep-walked in the middle of the night. My parents heard me banging around in the kitchen and put me back in bed. I had gone to sleep so excited about the eggs that I just couldn't wait til morning. It was the one and only time I have sleep-walked. Since I am now obsessed with cooking & baking, it was definitely a sign. Congrats on 100 posts and I hope to get lucky here with a prize! My own concoction with ramen noodles and cream of mushroom soup. It was horrible, and has almost completely turned me off of those two ingredients. Great giveaway! I'd love to win. 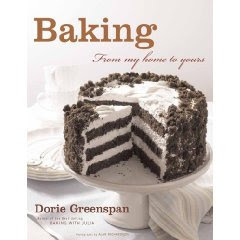 I've been eyeing the Dorie Greenspan book for awhile. I made scrambled eggs over and over again for a whole summer. I also ventured out on a recipe of macaroni and cheese. That was a summer of nothing else. My family got so sick of that. Congrats on your 100th post. I love your blog and check it out all the time. The first thing I cooked by myself was cheese toast unless you count all the things I made in my easy bake oven. The first thing that actually used a recipe was brownies. hmmmm...I had to think hard about this one. After much thought - the first thing I cooked my self was kraft dinner and the first thing I baked myself was cupcakes with my grandmothers cupcake sauce. Unfortunately I messed up the sauce and it was not edible. I wish I could remember the recipe - I hope she does. Congrats on the 100th post! I'm a newbie at blogging (14 posts and counting). I remember making chocolate crackles following the recipe on the back of the rice bubbles box. Yum! wow..you look great for 100! Mud pie was my first cooking attempt..and I made my sister eat it! If you count "Easy Bake" my first recipe resulted in a miniature chocolate cake which I consumed in about two bites. In the real world, I first made a banana and chocolate shake from a recipe in my Mickey Mouse and Friends Cookbook. The first recipe I made for myself-- probably cereal crusted chicken fingers! Yummy. They became quite a hit with my friends. We used to have sleepovers and I would bread up what seemed like hundreds of chicken fingers for a bunch of giggly girls. Congrats on 100 posts! I think all of your recipes are great so whatever you chose I will love! Love your recipes! Congrats on the 100th post! The first thing I remember making was brownies. My little brother and I use to make them together and sell them at our little lemonade stand during the summers. The neighbors loved it! So fun! Happy 100th! My 100th post flew by a few weeks ago and I didn't even realize it until after LOL! First recipe... didn't really have a recipe, but I remember making french toast by myself as the first thing. First recipe I think was for baking powder biscuits. Thank-you for having this very generous give away!! This is my first visit to your blog, I love the feel of it and I cannot wait to take some time and look at your archives! I'm sure it was some kind of cookie. I remember making a LOT of cookies when I was a child. Probably snickerdoodles. Love your blog and my family LOVES your recipes. Thank you so much. I remember making a pork chop casserole. I was 12. It involved browning pork chops and placing them in a casserole dish and covering with rice and cream of mushroom soup. How exciting! 100 posts! Blogger milestone indeed. I jumped on the cooking/baking train after I got married and a little domestication kicked in. My foodie mentor gave me the recipe for Broccoli, Potato, Cheese soup. Boy was it YUM! I'll take that Ina Garten cookbook now. Thanks. LOL. My first cooking memories were of my family's favorite treat, microwave brownies! I can still remember the smell of the cookbook! Is that weird? The first time I made them, I switched the sugar and salt, so they were unedible, but made for a good laugh! Thanks for all of your posts, as I look forward to each and every one! The first recipe I remember is Buckeyes. Yes, I'm from Ohio. Congratulations!!! Michal sent me... :-) wow, you have some great giveaways there. to be honest i am torn between the 1st cookbook and that last 4 cake pan... if i win, you can contact me at mrsdayseye@tiscali.it hope it is okay to be in Italy... if not, let me know... thank you. have a great day. The first thing I can remember making by myself was a birthday cake for my Mom. It was a 2-layer round cake, that was completely lopsided. The frosting was too thin and the top kept sliding off. Oh, well!! I do remember that it at least tasted good. That is the most important thing right?!? What a fun giveaway (ok totally amazing) and love your blog!!! The first recipe I made on my own was a grilled cheese sandwich and it was also the first recipe I modified on my own at about 8. First I added pickles, then I added bacon, then pickles and bacon for what was a perfect grilled cheese for me back then. Prudy, congratulations on 100...you're a blogging machine! My first recipe alone was Macaroni and Cheese from I think the Better Homes and Garden Microwave Cookbook! I left out the onions because I thought they would be too crunchy. What a fun giveaway! The first thing I remember making completely on my own was a chocolate cake for a teacher of mine. I wonder if that is the reason I'd rather make a treat than dinner! :) Congrats on your 100th post!! First recipe alone...Pancakes from the Fannie Farmer cookbook that I was so excited to borrow from the library. Boy, were they a loose mess! Aside from mud pies in the back yard, the first thing I remember baking on my own was a batch of Sugar Cookies from my Grandma's 1952 Family Circle cookbook. Mmm, yum! Love, love, love your blog...keep em' coming! I got your link from Michal. Probably the first thing I made myself with a recipe was Chocolate Chip Cookies. Congratulations on the 100th post! And what a cool giveaway. My memory is not that good...but I finally did recall a meal that I made for my college roommates back in the day. Baked Ziti. No written recipe, but it was based on how my mom made it at home and at our family restaurant. I was very proud of that meal! The first thing I remember making on my own was my grandma's oatmeal chocolate chip cookies--which I still think are the very best oatmeal chocolate chip cookies in the whole world! Great site, congrats on the 100th post. I baked those pilsbury cookies before learning to cook... I remember ALWAYS burning the last batch. And thanks for the recipe for pickles... I have these little cukes growing; and while dropping them into the clausen jar when the pickles were nearly gone worked, I know I need to make my own brine eventually. Microwaveable cakes...does that count as COOKING?! I made them everyday after school for my little sisters. Great Pumpkin Cookies from the Charlie Brown cookbook. I wonder if that book is still in my parents' basement -- those were good cookies. I wish I could remember vividly but having to guess I would say chocolate chip cookies. Ahh, I just realized I didn't tell you the first recipe I cooked on my own! Good thing I came back and read it again! First thing I ever remember making all on my own at home or at least trying to was creamed mixed vegetables . . . they were yuck. A big floury blog with bits of frozen veg stuck in it. Thankfully I got a lot better at time went by! Congrats Prudy on your 100th post! I enjoy your blog so much and hope you have hundreds more posts. My first solo flight in the kitchen was spaghetti and meatballs. Congratulations on you're 100th post! I love your blog and hope to be as good at this as you are one day! All the best for the next 100 and more!!! Love your blog...keep the posts a comin'! One of the first things I made in the kitchen was my grandmother's chocolate applesauce cake. Mmmmmm, still a classic. Congratulations on your 100th post. I look forward to more! The first thing I remember cooking alone (well, with a friend) was chocolate chip cookies. Her parents were away for the day so we took to the Kitchenaid. We beat the batter (with chips included) into a dark chocolaty pulp. We completely destroyed the chocolate chips, but I'm sure we loved the cookies. Don't remember how they turned out, just that the batter kept getting darker and darker as we continued to mix it. Funny. Pizza when I was six years old- it was a bisquick crust pizza crust. No bake Cookies. It took to long to heat up the oven. Congrats! Classic Chocolate Chip Cookies. Of course. I made these when I was at least 8 years old and so proud! It's still my favorite thing to make! Congratulations Prudy! Your blog is such a joy to visit, and your recipes and stories are always so much fun. The first thing I can remember making myself was a soup that was an 'original' -- it was a vegetable noodle soup with a 'secret ingredient' I made my mom guess, I remember making a HUGE mess in the kitchen and not wanting to clean up, nothing new there but now I kind of have to clean up since I'm the mom :) I was just about seven years old. oh goodness...this is embarassing...i think i made "pudding pie" (packaged graham crust layered with two flavors of instant pudding) and thought i was a gourmet chef! Congrats on your 100th post - I love reading your blog. By the way, I'm Michal's Aunt Kimberly. The first thing I think I remember making by myself was a birhtday cake for my Mom (as I remember I was not very happy with the outcome). Congratulations! I only discovered your blog sometime over the summer and enjoy your writing. I'm thinking back and I believe one of the first things I made was probably my mom's peanut butter cookies. You know the kind, with the fork marks on them to smooth them down. Total yum! Alone, right, not with help? I would have to say snickerdoodles, then! Yumm!! Lasagna & stuffed mushrooms for my high school friends. Sooo good! The first recipe I remember making alone was chocolate chip cookies when I was about seven. I'd done some other cooking (easy things like grilled cheese sandwiches) before, but I'd never followed a recipe on my own. Congratulations on your milestone! I just found your site in the last couple of weeks, and it is already a favorite. My first cooking venture was probably scrambled eggs, but I also remember making a lot of monkey bread as a kid. Biscuit dough rolled in cinnamon sugar and topped with a caramel sauce. Mmm, so good! Maybe I should teach my 8 year old how to make it. What a wonderful blog! I've really enjoyed your recipes and postings -- we've tried quite a few of them. Thanks you! I remember inventing a "Greek salad" that was truly awful. I think it involved grapes, pasta, black olives and cottage cheese. My family still teases me about that. Steph whoopie pies? what kind of blog is this, Chuck Woolery would be proud. When is the free car giveaway? Chocolate pudding pie with a lovely red vines and M&M candy garnish on the top! I was about ten and it was for a BBQ at a neighbors. I carefully carried it across the cul-de-sac, oh so proud of my creation, only to trip on the neighbors doorstep and have the pie fly through the air covering their newly wallpapered wall. Sigh. I was distraught. But recovered and started making bundt cakes. It was a natural progression. Congrats on the 100th post! I feel like a proud sister seeing all your success! What a great giveaway! I would love to win any of these. The first thing I cooked alone was a cake when I was about 8 years old. The first REAL thing I made from a recipe, all by myself? It was an entire dinner: roast chicken, stuffed baked potatoes, and a lemon meringue pie. I was 12, and I made the entire meal from scratch. The first thing I remember making by myself, besides mud pies, was scrambled eggs, and grilled cheese sandwiches. I was about 5. The first item I ever "baked" was "banana bread": my mom found me over a skillet with a piece of bread in it. I'd poured banana extract over it. I was 7. Wow, that's a tough question! I remember wanting to make my own lunches when I was like 6, so that was sandwiches. And then there was banana bread, and shepherd's pie, oh and muffins... But I don't really remember which came first! :) Congrats on your 100th post! Believe it or not, the first thing I remember making on my own was Lentil soup. It was a recipe that I learned from my grandmother. If she had celery, onions, and carrots, she could make you something fabulous! I still make the same soup exactly as she did! I am pretty sure it would make her very happy if I happened to win the new Ina Garten cookbook. Wow, 100 posts, Congratulations! I love your blog, fun, great to look at, and such yummy creations! What a fun give away, I hope I get picked for one of these fab prizes! The first thing I remember making on my own? Hmm, I think it would be a white cake with chocolate icing that I made with my Easybake oven, oh, circa 1967. I tried to make it as a surprise for me mom. All I remember is how hot the pan got and the icing running everywhere(icing on a warm cake). She loved it all the same, and brought it up many times. I haven't thought about that in years! wow! 100 posts! Congrats! the first thing I remember cooking was mississippi mud cake with my grandma. It's my grandpa's favorite so I wanted to make it all the time! Congrats! The first thing I remember making was a chocolate sheet cake - my Mom was there with me, but said I needed to do everything on my own. It wasn't perfect, but I loved how she ooohh'ed and aaahh'ed over it. I have been baking ever since! I'm guessing it was probably chocolate chip cookies or something. But I specifically remember giving Chicken Cordon Bleu a try and being pretty proud of myself. I remember making sugar cookies (or were they snickerdoodles) by myself when I was about 7 or 8. To this day, nothing makes me happier than baking cookies! Congrats!!! I love this site, and love your posts!! I don't remember what I made first, but what I made best for a long time were a copycat Cinnabon Roll. I do so much better than that now!! Congrats on your blog! I enjoy reading it everyday! I made the cilantro and honey chicken and tomatilla dressing last night for dinner. It was a big hit! My first cooking experience sticks out in my mind because I did it wrong. I made chocolate chip cookies but the dough turned out lumpy. I remember an adult asking me if I creamed together the butter, sugar and eggs first. I hadn't. Why should I read the recipe I was an annoying know-it-all. I learned a lesson on making cookies and I always think of that to this day when I'm creaming together butter, sugar and eegs. I also learned to always read your recipe through before you start!! My first recipe I made had to be chocolate chip cookies. Congratulations on your 100th post!!! !I remember being really little and making instant pudding with my sister. We would use an egg beater to mix the milk with the pudding. What a great giveaway! I am a bit embarrassed to admit, but the first thing I remember cooking was a cake when I was a teenager. Unfortunately I completely forgot to set the timer and forgot about the cake...until I could smell the burning smell coming from the oven. your writing, your photos, your recipes, ALL so yummy. my first time was an apple pie at my grandmother's home. My mother wouldn't let me cook because I was too messy and used too many dishes, but my grandmother just let me go crazy and made the best apple pie she ever had, at least that's what she told everyone for years! Scrambled eggs. It is simple but has infinite potential. The list of add-in's is endless. Congratulations on your 100th post! Since I've found you I will be checking in often. Love your site. What's the first thing I made all on my own? Funny you should ask. I just posted on my site, http://www.thesaucybird.blogspot.com, a picture and instructions for Bird's in a Nest. A deliciously easy egg treat! I tried a cranberry salad. and you would think that it would be fairly simple to make, but the recipe was not really close to me and i was disrtacted, so i ended up adding 1/4 cup of salt instead of 1/4 tablespoon! AHH! congrats and thanks for all you do helping others! Great blog! Not really sure what my first official recipe was. Probably scrambled eggs! Lasagne w/ baby meatballs. It was an abject failure. Recently stumbled upon your site, I'm hooked. Thank you for your efforts to educate us. Thanksgiving dinner at age 12! my moms banana pudding cupcakes were so yummy to make. jeez I miss her. Just found your blog! I LOVE it! The first recipe I remember making is spaghetti! lol. Congratulations on 100 posts! My first attempt at making something from a recipe was Jaime Oliver's balsamic marinated portobella mushroom sandwiches, a recipe I still make! You are so wonderful and amazing. One of the first things I think I made by myself was chocolate layer cake with seven minute frosting. I was probably about 9 years old. I remember it so well, tuna noodle casserole with potato chips on top. I was 12 years old #9 in a family of 13. I remember my Mom being so lavish with her praise and so appreciative that I had helped her.Now a Mother of my own 6 I know she really did appreciate my help. I made yeast cinnamon rolls right out of the gate when I was a 12-year-old 4-Her. My whole family was astonished and loved them. Nope, I don't make them today. Congratulations on your 100th post. Read your blog daily and use many of your recipes. Susie S.
I want a prizeee~! My first thing I made alone was scrambled eggs and ham for my mom on mothers day! No bake cookies. No question. Come to think of it, I haven't had one of those puppies in years. Too bad I can't move right now.